Underdog Clemson (15-0, 9-6 ATS) was covering the 5.5-point spread throughout its 44-16 rout of Alabama (14-1, 8-7 ATS) in the College Football Playoff national championship game Monday night outside San Francisco, and the game surpassed its total of 57 in the last minute of the third quarter. Underdog Clemson (15-0, 9-6 ATS) was covering [the 5.5-point spread](https://www.betchicago.com/clemson-alabama-predictions-spread-oddsmakers) throughout [its 44-16 rout of Alabama](http://www.espn.com/college-football/game?gameId=401032087) (14-1, 8-7 ATS) in the College Football Playoff national championship game Monday night outside San Francisco, and the game surpassed its total of 57 in the last minute of the third quarter. It came on true freshman Trevor Lawrence's third touchdown pass of the game, as the Tigers scored 30 unanswered points to end the game after Alabama had gone up 16-14 on a field goal on the second play of the second quarter. <a href="https://www.youtube.com/watch?v=c_sIuFaeoyA" class="embedly-card" data-card-width="100%" data-card-controls="0">Embedded content: https://www.youtube.com/watch?v=c_sIuFaeoyA</a> ## Clemson-Alabama betting recap Clemson closed as 5.5-point underdogs, and while oddsmakers [could see a cover coming from a mile away](https://www.betchicago.com/clemson-alabama-predictions-spread-oddsmakers), nobody expected this type of blowout. Lawrence, who was named the game's Most Outsnding Player, threw for 347 yards on 20-of-32 passing with three TDs and no interceptions. Justyn Ross finished with six catches for 153 yards and two touchdowns, while Tee Higgins and Travis Etienne also caught touchdown passes. Etienne rushed for two scores and had 86 rushing yards on 14 carries. Heisman Trophy finalist Tua Tagovailoa, who had four interceptions all season, threw two, including one for a touchdown to open the scoring, and finished 22-of-34 for 295 yards and two touchdowns. 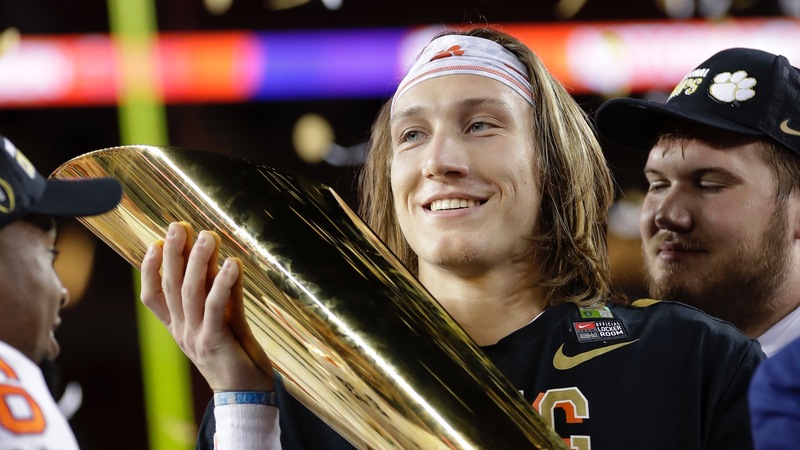 Clemson, which became the first team since Penn in 1897 to win 15 games, won its third national title (1981, 2016) and second in the last three years over the Crimson Tide. The teams have met the last four years in the College Football Playoff, but Monday wasn't only the most lopsided of the four, it was easily the worst loss for Nick Saban in his 12 seasons at Alabama. (There's only been 21 of them.) <a href="https://twitter.com/JoshDubowAP/status/1082483034073382912?ref_src=twsrc%5Egoogle%7Ctwcamp%5Eserp%7Ctwgr%5Etweet" class="embedly-card" data-card-width="100%" data-card-controls="0">Embedded content: https://twitter.com/JoshDubowAP/status/1082483034073382912?ref_src=twsrc%5Egoogle%7Ctwcamp%5Eserp%7Ctwgr%5Etweet</a> ## Clemson-Alabama prop bets It was a busy start for prop bets, as a defensive touchdown +160 came in with the first score, and Clemson to score first was +125. <a href="https://twitter.com/jsimbal/status/1082455301599649792" class="embedly-card" data-card-width="100%" data-card-controls="0">Embedded content: https://twitter.com/jsimbal/status/1082455301599649792</a> Here is a complete list of props, courtesy of the South Point sports book... <a href="https://twitter.com/andrewssports/status/1082380159167037440" class="embedly-card" data-card-width="100%" data-card-controls="0">Embedded content: https://twitter.com/andrewssports/status/1082380159167037440</a> ## 2020 national championship odds Clemson opened as the 9/5 favorite at the Westgate Las Vegas SuperBook postgame, while Alabama is 5/2. Both Lawrence and Tagovailoa will be back next season. Ohio State and Georgia are the thrid favorites at 12/1, Michigan is 14/1, Oklahoma 15/1 and Texas 20/1.